Hardcover, 11.6 x 8.8 in. / 416 pgs / 313 color. The great march of Italian fashion, with the boom in ready-to-wear. Italiana sets out to celebrate Italian fashion in the crucial years from 1971 to 2001 and to tell its story, highlighting the progressive and bringing into focus the establishment of an Italian fashion system in that great period of Made in Italy that set the seal on the Italian lifestyle's leading role in the world. 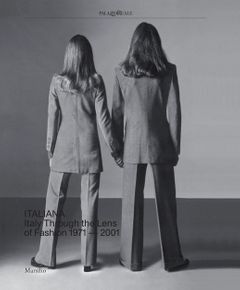 This volume is produced to coincide with the exhibition "Italiana. Narrating Italian History Through Fashion, 1971-2001" (open February 21, 2018 through May 6, 2018) and presents Italian fashion as a polycentric phenomenon fed by a wide range of know-how and intelligence, illustrated with an important set of pictures, some taken by photographers for magazines but others the fruit of collaboration with the designers. It also contains previously unpublished essays on less well-known themes and an anthology of texts previously published by Italian writers in the years under examination. FORMAT: Hbk, 11.6 x 8.8 in. / 416 pgs / 313 color.